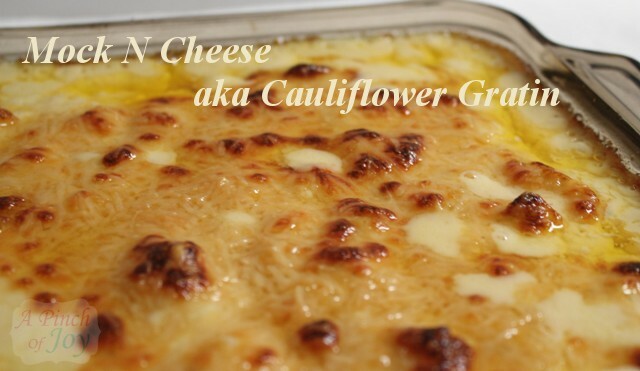 Cauliflower au Gratin — cheesy goodness as a main dish or a side dish. Cauliflower, Mark Twain once sniffed, was nothing but cabbage with a college education. Boiled and buttered, the way grandma used to do it, cauliflower was nothing to write home about. Now it is everywhere. Cauliflower first appeared on vegetable trays, in snack packs and anywhere a crunch was needed. Then low carb dining became important. Cauliflower is only 5 carbs per serving and it’s somewhat bland flavor and good texture makes it an acceptable substitute for potatoes, pasta and rice. This classic au gratin recipe makes a substitute for Mac n Cheese. Mock N Cheese! My sister, Vee, told me it was not a good name if I had to explain it. First she hinted ever so diplomatically with a laugh and a hmmmm — or maybe it was a snort like a hmmmm. Precook the cauliflower in the microwave, covered, just enough to make it crispy soft – you can put a fork in it, but it retains some of its crispness. While it is microwaving, begin to make the roux in a large pan. The onion and garlic aren’t enough to jump out, but they give a depth to the dish. Same with the nutmeg – although you can smell it during baking, you can’t really taste it. The cheese does play a part in the flavor, but you can adjust to what you have on hand and what your tastes are. The milk and cream can vary, as well. If you have only whole milk on hand, use 2 cups. Two cups of half and half work or if you want a richer flavor use all cream. You can leave the cauliflower in sections, just as you placed them in the baking dish and pour the cheese sauce over it. You will have a proper cauliflower au gratin then –especially if you also sprinkle a couple tablespoons of seasoned bread crumbs over the top before baking. To make it a substitute for macaroni and cheese, run a sharp knife through the partially cooked cauliflower in the pan until the texture is somewhat reminiscent of large elbow macaroni. Pour on the cheese sauce and bake for Faux Roni? Mock N Cheese? Good stuff! I am doing low carb so this is a GREAT find for me! I can’t wait to try it!!! 🙂 Thanks! Would love for you to stop by toddlindsey.com! Made this last night (finally!) and tweaked it to make it low carb. It was delicious! Thanks for the mention! The cream cheese is a nice addition! 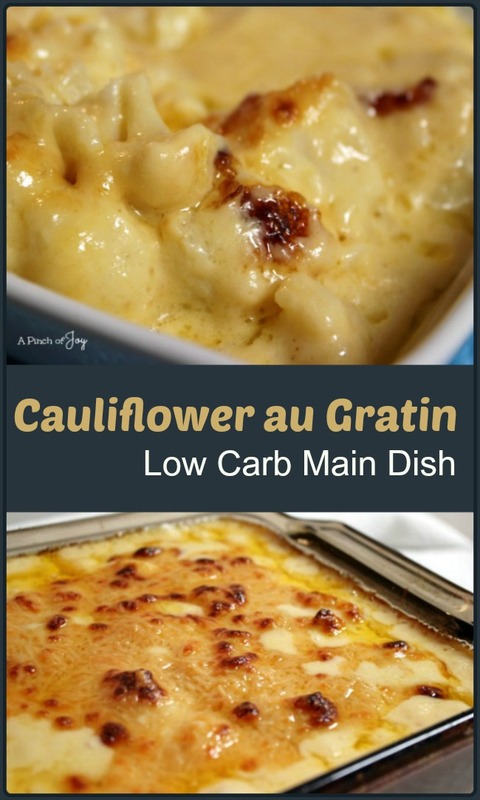 My hubby is on a low carb diet and Cauliflower is his favorite veggie. He is gonna love this! Mmmmmm! Pasta is not my friend, it sticks to me like super glue. This I have to try!! Pinning! Looks like the real deal. I can’t remember what it was, but a friend of mine served us a dish that had been substituted with cauliflower. I was surprised when she told us. It really is good. Thanks for sharing this healthy option at Show & Tell. Mmmm, I haven’t had cauliflower in so long (i’m the only one in the family who likes it)! this looks fabulous!